How much does a tattoo removal cost? Costs and a few examples of tattoo removal. We hear the question about the costs of tattoo removal every day. But is not always easy to give a right answer. The price of a professional removal treatment is approximately the same. Depending on the size and location of the tattooed area, it is about 100-250 euros per session. The total cost of tattoo removal, however, depends on the number of sessions, and this varies in every individual case. On average, 1-4 treatments are required to remove permanent make-up on eyebrows, eyelids or lips. A small tattoo can be removed with 2-3 treatments. The number of needed treatments depends on the amount and density, as well as depth of the implanted pigments, type and condition of the skin, presence of scar tissue. 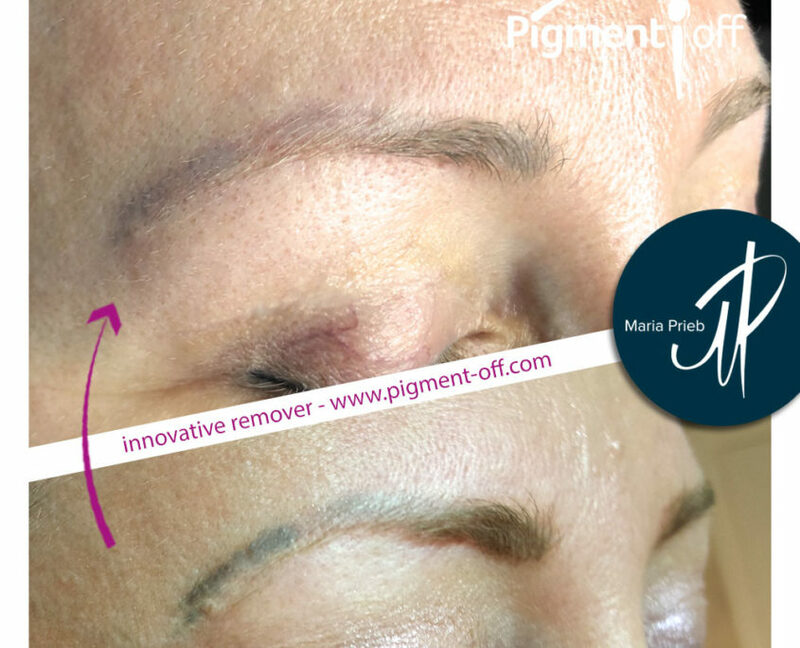 Removal of Permanent MakeUp on eyebrows after an unsuccessful attempt of laser treatment. Result of 3 removal sessions. How expensive is the removal of microblading? Removal of microblading is a very sensitive topic and depends on many factors. Often the skin is scarred after unsuccessful microblading treatments, the skin structure is changed, so that the pigments are often stuck in accumulations of connective tissue. 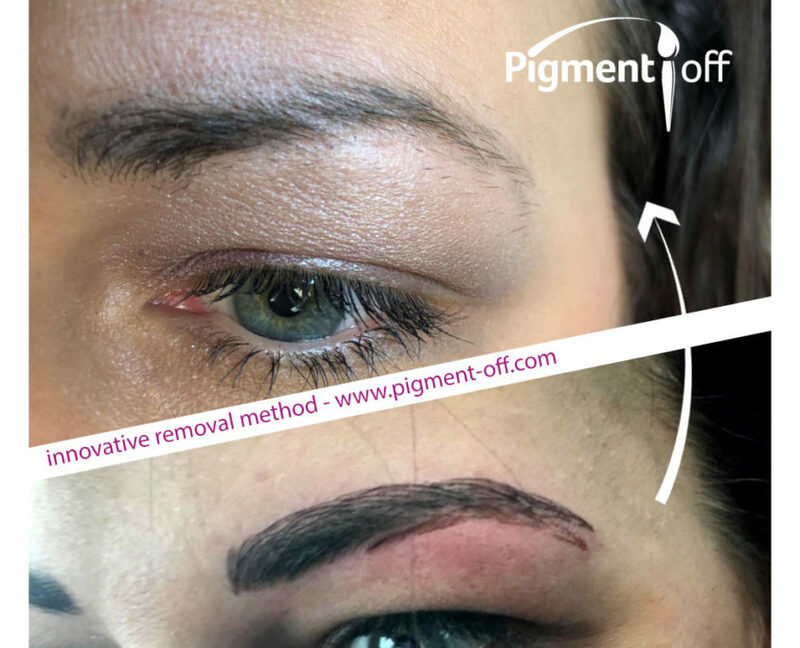 Depending on the grade of the skin injury and the number of previous microblading sessions, one to 5-6 removal treatments with “PigmentOff” remover may be required. Removal of fresh microblading on eyebrows. Result of 1 removal session. Is it possible to calculate in advance the cost of removing tattoos / permanent make-up? Experienced PigmentOff masters can tell you the approximate number of removal treatments (and thus the associated costs) by watching the photos. However, to more or less accurately predict the cost of removal, an on-site assessment of pigmentation / tattooing is required. For this reason, it is advisable to arrange a consultation with a beautician of your choice. Can it be that a removal is more expensive than the pigmentation itself? Even such cases are not rare. Unfortunately, we regularly see results from totally unprofessional tattooing / permanent make-up / microblading treatments. The main problem of such work is the too deep implantation of pigments, often accompanied by scarring / fibrosis. Such skin conditions make the removal of pigments more difficult. More sessions are required, the condition of the skin needs to be taken into account, the regeneration of the skin takes longer and requires more care and additional skin regeneration treatments. Accordingly, the cost of such tattoo removal is higher, the duration longer than with the removal of professional pigmentation.